“I have no words. I am really happy”. These are the words of the Gibraltarian beauty who was crowned as Miss World 2009 at the glittering finals night in Johannesburg, South Africa on December 12, 2009. 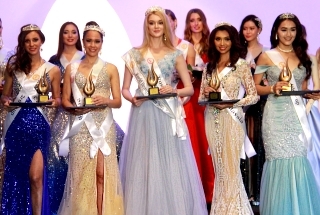 Kaiane Aldorino set forth a record as the first Miss Gibraltar ever to get through the semifinals of the Miss World beauty pageant. Kaiane Aldorino was born on July 08, 1986. Before she became Miss Gibraltar 2009, Kaiane worked in St. Bernard’s Hospital as Human Resources Clerk. This brunette beauty is able to speak two languages, English and Spanish. As a pastime, she finds herself training in the gym or enjoying herself playing netball. This queen has been a dancer since she was 14 years old. Young as she is, she was able to perform locally and abroad. She was a part of Urban Dance Group and has a formal training in Modern, Hiphop, Contemporary and Commercial styles. Perhaps, her greatest achievement as a dancer was when she participated in the 2008 International Dance Organization World Showdown Championship held in Germany where she represented her country in the Formation category as part of the Gibraltarian National Team. As a result, Gibraltar landed 17th place and made a history because it was the first time that Gibraltar passed the initial phase of the Formation Category. It was undeniably a history when Kaiane came out victorious in obtaining the much sought Miss World crown. 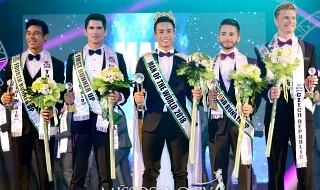 Shortly after Kaiane Aldorino has been crowned by her predecessor Ksenia Sukhinova of Russia, pageant fanatics in different beauty pageant sites came up with different reactions most of those are reactions in dissent with the actual result of Miss World 2009. We frequently hear comments such as but not limited to; “she is undeserving winner”, “the ugliest Miss World ever”, “she is very ordinary to be Miss World” and “…over the goddess Perla Beltran?”, thus, becoming a highly opinionated issue. But amidst all of these contradictory reactions from the pageant fanatics, Gibraltar burst into celebration. People from all walks of life went out of the streets singing, dancing, and chanted with jubilation, the cars hooted their horns. The Gibraltarian National Flag was waived by the masses. There is also a massive and colorful fireworks display which lasted for hours as the Gibraltarian Government had willingly allocated a budget for it in honor of the newly crowned queen. During her reign, Kaiane traveled to United Kingdom, Gibraltar, Japan, Brunei, Hong Kong, Canada, United States, Spain, Germany, Korea, Italy,Indonesia, South Africa, Ireland, and China. Kaiane’s return to her homeland was truly anticipated by her fellow Gibraltarians. A press release has been issued by the Government of Gibraltar enumerating the details of events that would take place upon the arrival of the newly crowned Miss World. Chief Minister Peter Caruana considered her victory as a “wonderful achievement for her and for Gibraltar” and prepared a "homecoming fit for a queen". During the homecoming of this Gibraltarian queen, all businesses are requested to close from 04:00 pm to 6:00 pm to take part with the celebration. Miss World Event Director Steve Douglas was really amazed and declared "I have taken many Miss Worlds home but we have never had a welcome like Gibraltar – never did we expect this – what a beautiful, beautiful country!" He added "It was our job to bring your daughter home, the daughter of Gibraltar, to celebrate with the whole country!" Later she was awarded with the FREEDOM OF THE CITY OF GIBRALTAR and GIBRALTAR MEDALLION OF HONOUR by the unanimous vote of the Gibraltarian Parliament recognizing her "extraordinary personal achievement in becoming Miss World 2009 and … the enormous pride and global recognition that her achievement has represented for Gibraltar as a whole." Yes, it is without a doubt that Kaiane's victory is one of the least accepted by the pageant world especially those pageant fanatics who were rooting that time for the so called better candidates. I know that many of you here will raise dissenting opinions but for me, Kaiane is also in no way inferior than the other candidates the night when she was crowned. 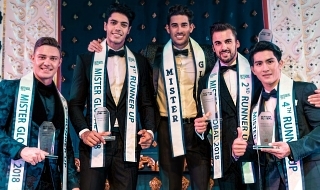 Being able to win a fast track e.g.the Miss World Beach Beauty is in my own opinion a testament that she is doing good in the competition and indeed one of the front runners. I have to concur on what ADMIN XAMURAI has posted in my first ever thread entitled REMINISCING BROOK LEE'S LOVELY PERSONALITY, he said that "When a girl won at a particular year, it's because she's the best. It is stupid to compare her to another winner, more so, to rank all of them in terms of physical beauty alone. Who can really tell that the 1955 winner is much better or worse than the 1995 winner? Were they there to witness the respective victory of both? When I read people's comment that Brook is the worst Miss Universe winner, or "ugliest Miss Universe winner ever"... I just shrug them off and conclude that the ones who make such statements are not genuine pageant fans, but simply a "pageant viewer". Here in Missosology, we value a genuine pageant fan... a pageant analyst. That's the mantra of Missosology. ANALYSIS". I simply love those words coming from one of the respected individuals here in Misso. Truly, winners have their own unique traits. There must have been something in her or about her that judges have seen worthy to give her the Miss World title. Last edited by freddy26 on Fri Feb 01, 2013 1:17 pm, edited 6 times in total. Great thread!!! Kaiane's not bad. The thing that was bad was Julia Morley's method of choosing a winner. One year she chooses a goddess, the next year she chooses some random girl from a country/territory with affiliations to the British monarchy. And to add insult to injury, she'll place a goddess in the runner-up position, which is really painful to watch. XAMURAI wrote: Great thread!!! Kaiane's not bad. The thing that was bad was Julia Morley's method of choosing a winner. One year she chooses a goddess, the next year she chooses some random girl from a country/territory with affiliations to the British monarchy. And to add insult to injury, she'll place a goddess in the runner-up position, which is really painful to watch. Thank you so much Admin XAMURAI... Judging is really subjective.. She may be such an ordinary girl for some but she may be considered a GODDESS by the others.. When the result was announced I was rooting for the goddess PERLA... But when the winner was declared, to my mind she was not a BAD CHOICE at all.. To the very least I felt contented with the result knowing the fact that girls with WEAK sash factor can put up a good fight in a major beauty pageant.. Truly, when POLITICS takes place, the pageant will surely be a MESS but somehow the existence of POLITICS makes the results UNPREDICTABLE thus making it more EXCITING and really DRAMATIC because the pageant world will surely have different thoughts.. But other than that, the main purpose of this thread is certainly to highlight the way on how her fellow GIBRALTARIANS took her victory.. It's just so amazing that when she came back home she was consider a GREAT STAR..
Much thanks ADMIN XAM for your thoughts.. I am learning a lot from you... Best regards..
Having personally spoken to several of the contestants of Miss World 2009, I will share that every one of them thought that she by a long margin surpassed Perla Beltran in beauty. This is their opinion, not mine. Their consistent feedback was that Kaiane was absolutely stunning in person with a charisma and beauty that maybe pictures could not capture, whereas Perla needed a lot of makeup to look like she did. She may not have had the startling photogenic quality of some of her rivals, but on stage, I thought she stood out. Her skin, her smile, her hair, all shone briter than any others. Perla, IMO, while very beautiful was so dull and uncharismatic that night (to say nothing of her maternity gown), that I honesty think it was a miracle she even got to the top three. Personally, I would have placed girlslikeVietnam orKorea ahead of her. Kaiane is not comparable to our Brook. If there's someone who was comparable to Brook Lee from Kaiane's batch, definitely it's not her but the very charismatic Chloe Mortaud of France. The Miss World selection process was not as clear as Miss Universe, expecially if we compare her victory to that of Brook Lee's. MW is a mystery. Jon A wrote: Having personally spoken to several of the contestants of Miss World 2009, I will share that every one of them thought that she by a long margin surpassed Perla Beltran in beauty. This is their opinion, not mine. Their consistent feedback was that Kaiane was absolutely stunning in person with a charisma and beauty that maybe pictures could not capture, whereas Perla needed a lot of makeup to look like she did. Last edited by freddy26 on Thu Jan 31, 2013 2:27 pm, edited 1 time in total. If Cayman Islands and Turks and Caicos both of which are British Overseas Territory can compete in Miss Universe,why Gibraltar is not represented? Agree... You know what, it has also been my observation when I reviewed the video of the coronation night of Miss World 2009 that I really find CHLOE attractive... It's only now that I was able to feel that CHLOE possessed such CHARISMA..
MUCH WAS SAID ABOUT THE WINNER. I'M ONLY AN EXPECTATOR NOT A JUDGE BUT IT'S QUESTIONABLE ON HOW JULIA CHOSES THE WINNER. AFTERALL, SHE 'S THE ONE READING THE SETS OF WINNERS AND I BET SHE RANDOMLY PLACED THEM THE WAY SHE WANTED IT.I'M SURE IF TRUMP WAS READING THE WINNERS HE'LL DO THE SAME THING.BUT HE NEVER DID AND THAT'S THE GOOD THING. HOWEVER,IT'S OVER AND I HAVE MOVED ON. THERE'S NO NEED FOR ME TO DWELL.I HAVE RESERVED MY ENERGY FOR SOMETHING BENIFICIAL THAN TO DWELL. NO PREOCCUPATION ON MY SIDE. AS TO THE WHOLE SHOW, COULDN'T THEY GET A GOOD EMCEE'S ? SHE BORING/TIRESOME/TEDIOUS. THE STAGE WAS HUGE LIKE A FOOTBALL STADIUM AS COMPARED TO MISS UNIVERSE WHERE IT'S A LOT EASIER TO COMPARE EACH OTHERS BEAUTY. I NEVER WATCH LIVE MISS WORLD SHOW ANYWAYS. Message: I'D RATHER TALK TO A REAL WOMAN THAN A FEM. jayhoo wrote: MUCH WAS SAID ABOUT THE WINNER. I'M ONLY AN EXPECTATOR NOT A JUDGE BUT IT'S QUESTIONABLE ON HOW JULIA CHOSES THE WINNER. AFTERALL, SHE 'S THE ONE READING THE SETS OF WINNERS AND I BET SHE RANDOMLY PLACED THEM THE WAY SHE WANTED IT. HOWEVER,IT'S OVER AND I HAVE MOVED ON. RHERE'S NO NEED FOR ME TO DWELL.I HAVE RESERVE MY ENERGY FOR SOMETHING BENIFICIAL THAN THIS. NO PREOCCUPATION ON MY SIDE. Thanks for your insights and thank you for appreciating my thread... The main purpose of this thread is not the discussion of the pageant per se... As you have noticed I never tackle nor give any depth on discussions about the final's night.. The core of this thread is really to show how the Gibraltarians took the victory of their representative...I am just emphatic to share that after her victory, Kaiane was really treated like a queen by her countrymen... Best regards to you.. I really admire this woman . I love her beauty One in a MILLION! Message: If eyes are meant for seeing,then beauty is its owns reason for being. chellomellow wrote: I really admire this woman . I love her beauty One in a MILLION! Thank you for dropping by and posting what you feel my friend...I really appreciate it..
What you have said is a great thought to ponder.. Thanks for dropping by and posting your insights here..
Guys, please watch out for the additional videos that I have posted it includes the videos during her HOMECOMING and the videos of her visits to KOREA and ITALY as well as a video that features GIBRALTAR.. Personally loved Kaiane's beauty, its very natural and refreshing. I wouldn't mind her being crowned Miss World any day, because she has something above average which people don't see, often mistaking her for a weak contestant. BeautyForever wrote: Personally loved Kaiane's beauty, its very natural and refreshing. I wouldn't mind her being crowned Miss World any day, because she has something above average which people don't see, often mistaking her for a weak contestant. Thank you for sharing with us your thoughts in my thread... Her victory was frowned upon by many but shall I say she was a good Miss World no matter what..
Great thread! I did not expect her to win but I am glad she did. She really deserve her Beach Beauty win. terese23 wrote: Great thread! I did not expect her to win but I am glad she did. She really deserve her Beach Beauty win. Thank you Therese dear... Me too, I don't expect her to win but she wasn't a bad choice though.. Thanks for liking my thread.. I am so glad she won, for once a major pageant title was not taken by the usual powerhouse country. Jon A wrote: "... whereas Perla needed a lot of makeup to look like she did. " Point well taken... Thank you for visiting my thread..
Kaiane got bashed for beating the favourite who came so close as 1st runner up. Her win wasnt a surprise to me, especially after she won Beach Beauty. I was expecting a home town win for South Africa or even a black Miss France, Chloe Mortaud but guess Gibraltar won her he judges with her gorgeous figure and simple and sincere personality. I also like it when underdog countries triumph over the over hyped powerhouse queens. It give small countries hope. kristof wrote: Kaiane got bashed for beating the favourite who came so close as 1st runner up. Her win wasnt a surprise to me, especially after she won Beach Beauty. I was expecting a home town win for South Africa or even a black Miss France, Chloe Mortaud but guess Gibraltar won her he judges with her gorgeous figure and simple and sincere personality.